Do you need a custom printed four page printed obituary to remember your loved one? Our funeral handouts, also known as memorial pamphlets, have a front and back cover and two interior double sided pages. 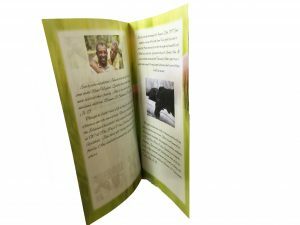 Each custom four page funeral program is printed on high-quality paper and pre-folded before delivery. These funeral handouts are an economical choice starting at $2.90 for a quality of 10 or 50 with a quantity discount thereafter. 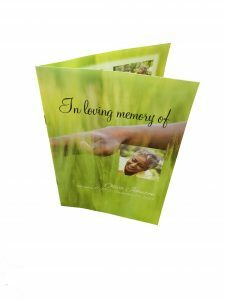 Funeral handouts and printed obituaries are printed on 8.5 x 11 inch high quality paper and then folded. When delivered, these memorial pamphlets measure 8.5 x 5.5 inches. Funeral leaflets are circulated at the church or mortuary at the time of the service. Memorial handouts can also be mailed as a death announcement for relatives who are unable to attend the ceremony. Would you like a tangible reminder of your loved one for years to come? Our laminated obituary bookmarks are double sided and feature a memorial photo. Close family and friends will appreciate the practical and thoughtful gift. This is just one of many that we offer in our helpful blog. Do you need more space to memorialize your loved one? Our funeral service programs provide multiple opportunities for family photos, the obituary, and order-of-service information. Each memorial program is pre-folded and saddle-stitched before being mailed. Place your order before 3pm EST and your package will be shipped the same day. Please call 1-800-774-4313 to help you design your funeral printing service product for no additional charge.